I grew up as an only child. While I'm very lucky to have an amazing half brother and half sister, I never lived with them, and I am the sole child of my mom and dad. My mom's an only child herself, and my dad had just one sibling. What am I getting at? I grew up feeling like my family was small. But that's really not the truth, as I was reminded the other day at my cousin's lovely wedding on Long Island. My immediate family may be pretty compact, but I think I never really realized how large my extended family is until they were all in one big room together. Our numbers are thanks in part to my maternal grandfather's prolific siblings and all their children and grandchildren - one of whom is my cousin Laura, the beautiful bride we had gathered to celebrate that day. My Pop Pop was one of 6 children born to Sicilian Immigrants who originally settled in the Lower East Side of Manhattan before hopping the East River to Brooklyn and Queens. This recent wedding, filled with people that I don't see nearly enough of, definitely brought back warm memories of my departed grandpa, and I left what was a fantastic evening feeling really invigorated. I had people! Lots of them. And we all had such fun together. 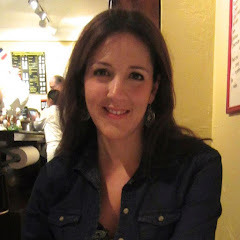 The next day, on a bit of a family-togetherness high, I was struck by the overwhelming urge to cook something to celebrate my Italian heritage. Ok, this happens a lot - but I wanted it to be something to honor my grandpa, my spicy Sicilian bloodline, and our family's proud peasant beginnings three generations removed. Ours is in no way a unique American story, but something to be celebrated nonetheless. I decided on one of the many simple dishes that can be found in Italy - Pasta con Cavolfiore, aka: Pasta with Cauliflower. I know, I know - it doesn't sound terribly exciting, but you'll be surprised at how its classic, clean flavor, beautifully understated, is actually quite satisfying. This dish also takes me back to growing up and to my mom's cooking. She is superb in the kitchen, but as a kid, with the exception of meatballs once in a while, dinner was nearly always Pasta with a Vegetable. Pasta with Broccoli, Pasta with Cauliflower, and on, and on. This type of largely vegetarian low-cost eating was probably a function of our less than ideal financial circumstances back then, but I didn't know the difference. I didn't feel like I was missing anything - because I wasn't. This is the type of food that The Greatest Generation was reared on - simple, healthy, and cheap. My great Aunt Mae makes a to-die-for version of Pasta with Cauliflower. She serves hers with toasted breadcrumbs on top after painstakingly trimming the Cauliflower florets into perfectly uniform bits. Pasta con Cavolfiore actually originated on the Southern Italian mainland, but it is very popular in Sicily. Here, we'll be using Conchiglie, or Shell Shaped Pasta. Please don't be scared off by the Anchovies in this recipe. They totally melt and disappear into the oil providing a non-fishy, subtle flavor that works so well in this and many dishes. Husband (the Anchovy-hater) had no idea. Buon Appetito! Remove the Cauliflower base and allow the Cauliflower head to separate into bite-sized Florets. Pick apart Cauliflower with your hands to help it along, and finally, give it a quick rough chop to achieve a uniform size so the Cauliflower cooks evenly. Boil water in a medium sauce pan with a good amount of Salt. 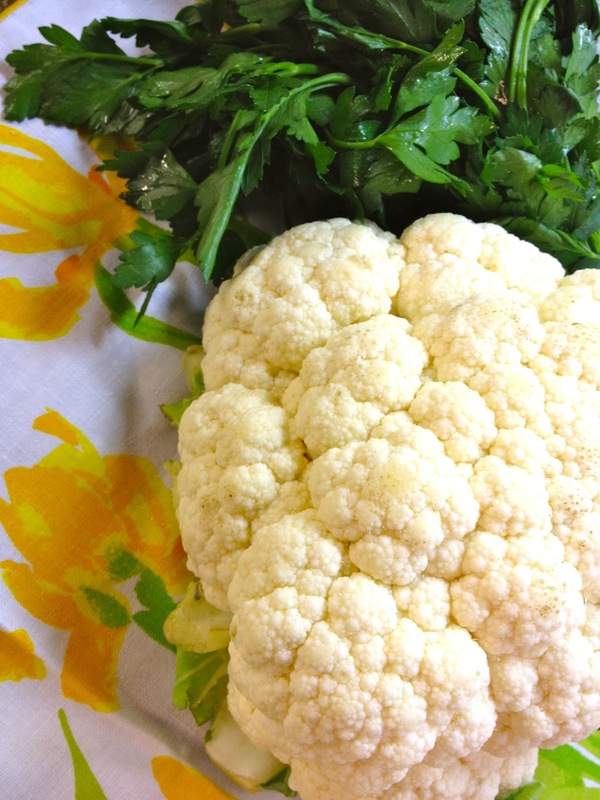 Add Cauliflower Florets and cook them several minutes until they are tender but not mushy. About 4 minutes should do it. The final texture is really up to you. I generally enjoy my veggies more al dente than the next guy. Once finished, drain the Cauliflower through a colander set atop or inside a large heatproof bowl. You'll want to reserve all of your boiling liquid. Set Cauliflower Florets aside and return liquid to the sauce pan or larger pan to boil your Pasta. Add extra water if needed. Return Liquid to a boil and cook your Pasta Shells as directed on the box until Pasta is done. Remember, al dente is always best! While Pasta is cooking, set a large skillet over a a medium-low flame. Pour in about 2 Tablespoons of Olive Oil, the Garlic, and the Crushed Red Pepper. Take care not to burn the Crushed Red Pepper or Garlic, and stir everything occasionally until the Garlic becomes slightly golden. Next, add the Anchovies. Allow them to melt into the oil. This should take 3 or 4 minutes. Feel free to stir a bit to help them along. Once Anchovies have dissolved, add the drained Cauliflower Florets into the skillet. Toss everything to combine. Lower the flame to the lowest possible setting while your pasta finishes cooking. Once Pasta is ready, drain it in a colander reserving about a 1/2 cup of Pasta Water. Pour drained Pasta into the Cauliflower skillet and toss. Add a couple of Tablespoons of Pasta Water and turn the flame back up to medium. Cook a bit longer until the liquid boils away and thickens. Stir in Parsley and toss. Turn off the flame. Season carefully with Salt (remember that Anchovies can be salty already) and liberally with Black Pepper. Drizzle with good quality Olive Oil. Lastly, feel free to add additional Crushed Red Pepper if you like. Serve and enjoy! This past week, with the weather turning cooler, some spicy and comforting Mexican style food seemed like just the thing. The two dishes I decided to make ended up being polar opposites. 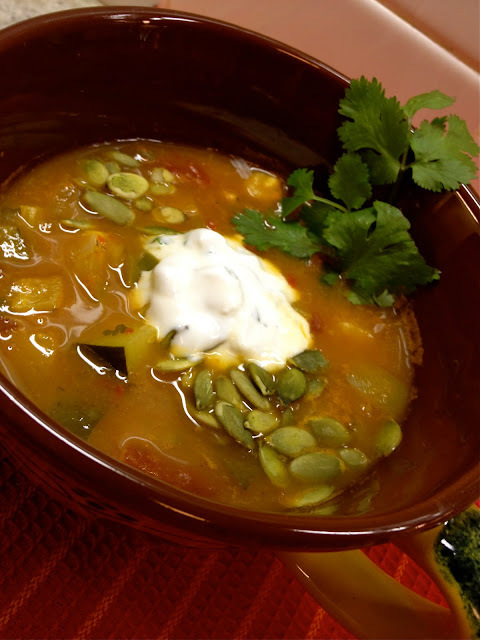 The first, a healthy Mexican-inspired chunky Vegetable Soup, could not have been more light and virtuous. The recipe uses no fats and packs a major flavor wallop. 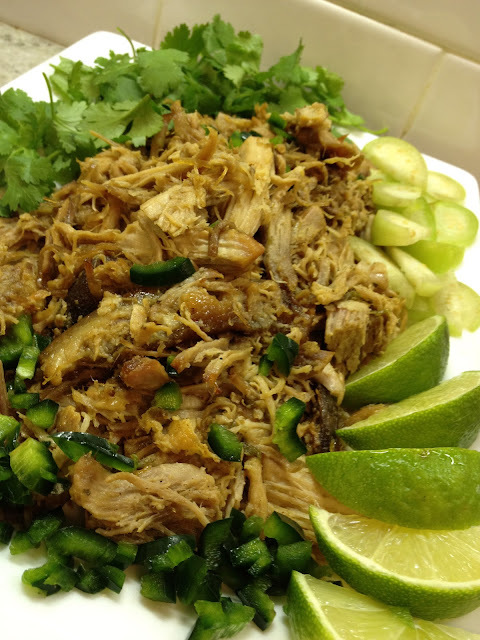 On the other hand, our second dish, an all-afternoon project perfect for a lazy Sunday, was a luscious, slow-cooking, meaty and rich batch of Pork Carnitas. Garlicky, Jalapeno-inflected goodness melts into shreds of delectable Pork finished with a bit of Orange Juice. Just perfect for serving in a warm Tortilla, the Carnitas can also be optionally topped with just a little Lime Juice, a sprinkling of chopped Poblano or extra Jalapeno, and a dollop of Sour Cream. Sometimes when I am deciding what to eat, I envision a cartoon angel and devil on on my shoulder. I feel like they take turns whispering to me: "eat healthy, eat naughty, eat healthy, eat naughty." So, in short, the two dishes featured below will allow you to choose your food based on whether you're feeling naughty or nice. Both recipes will feed a family of two for several days and they actually work very nicely when served together. Enjoy! *Cook's Note: This recipe has the potential to come out Very Spicy. Depending on variations in the spice factor and size of the peppers you buy, you may want to lessen the pepper profile if you are spice averse. To make it milder, be sure to de-seed the Jalapeno and perhaps use a bit less of the Poblano. You can always add more at the end. The spice level as listed below was just fine for me and my husband, but when I brought the leftovers to work, only the people with super spicy palates could handle it, even though they all told me it was tasty :) Thanks for bringing me back to reality guys! Put Garlic, Zucchini, canned Tomatoes, Onion, Hominy, Green Pepper, Tomatillos, Jalapeno, Poblano,Oregano and Cumin in a very large soup pot. Pour Vegetable Broth into pot. Next, in a mini food processor combine the Roasted Red Peppers and Chipotle in Adobo Sauce into a puree. Add this mixture to the soup and combine well. Cover pot and bring to a boil of high heat. Once boiling, lower the heat to a simmer and cook, partly covered, another 10 minutes. Stir in Vinegar, Lime Juice, Cilantro and Salt. Serve now or prepare the Cilantro Crema. Do so by combining all the ingredients except the Pepitas in a small bowl. Spoon a dollop over soup and scatter Pepitas over it everything. Enjoy! Next up, the perfect slow-cooking pork Carnitas. Attempt this recipe when you know that you'll have the 5 hours needed to monitor it. The active time is very little, so even though the timing may seem daunting, the result makes this well worth it, and as I said, it will feed you for quite some time. The Carnitas store well in the fridge and will keep for about 3 days. Preheat Oven to 325. Place Pork in a roasting pan with high sides. Drizzle with Oil and spread it all over. Turn Pork fatty side up and sprinkle with the Chile Powder. Season liberally with Salt and Pepper. Add about a 1/2 Cup of Water to the Pan and cover with foil. Bake for 1 hour. Add Garlic Cloves all over the pan and toss in Jalapenos as well. Bake uncovered for another 2 hours, rotating the pan midway for even cooking. Raise oven temperature to 375. Remove pan from the oven and carefully slice pork into 4 or 5 thick slices. Using two forks, pull the Pork apart until large chunks form. Arrange chunks in the pan with the browned parts facing up. Remove Garlic from the Pan and peel it carefully (it may be hot). Return peeled Garlic Cloves to the Pan. Continue to Roast pork another 30 Minutes until nicely browned and slightly crisped. Again, pull Pork using two forks into smaller pieces and cook another 30 minutes longer. Transfer Pork, Garlic, and Jalapenos to a large platter for serving. Pour off all but 2 Tablespoons of fat from the roasting pan and place on top of stove burners over medium high heat. Pour in Orange Juice and boil until reduced a bit, scraping the bottom of the pan to catch some of the browned bits for extra flavor. Pour over Pork and toss to incorporate. Season with additional Salt and Pepper and serve in warm tortillas. Ever wonder which Neurotic Kitchen recipe gets the most action? Of course not. But it will come as no surprise that such questions take up a large part of my brain space. Who's the runner up? NK's Weeknight Brussels Sprouts. My original recipe for everyday Brussels Sprouts is easy, reasonably healthy, and a crowd-pleaser, but I must say, the consistent popularity of these humble Sprouts both surprises and delights me. I think it's safe to assume that Brussels Sprouts have finally edged their way up the food chain taking a place of well deserved honor, their bad reputation a distant memory. Way to go, little guys! Today's restaurant copy-cat Sprout side is the polar opposite of its simpler Neurotic Kitchen predecessor. Created by the chefs at ilili in NYC (ililinyc.com), a fantastic upscale Lebanese/Mediterranean restaurant that's SO well worth a visit, this dish is so incredibly unexpected, creative, and complex - you'll be thinking about it for days. 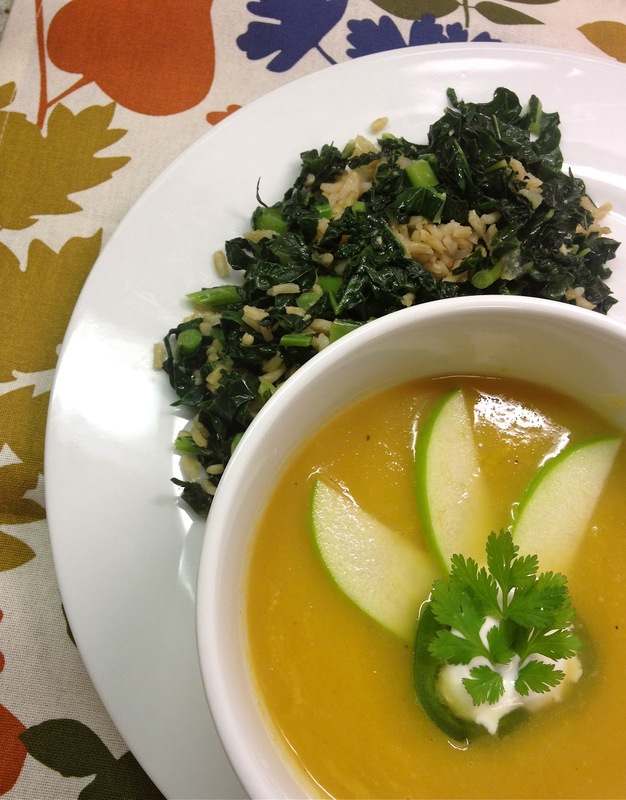 When was the last time you fantasized about a veggie side as much as the main event? They are that good. 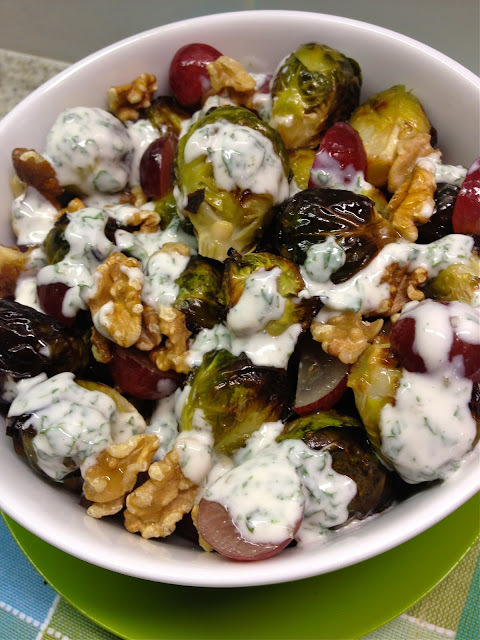 ilili Brussels Sprouts get their sweetness from a drizzle of fig puree, their richness from a few swirls of creamy Yogurt, and a pleasant crunch from the crispy outer layer of the roasted (or deep-fried) Sprouts and a sprinkle toasted walnuts. Additions like juicy Grapes, Sherry Vinegar, and Mint Sprigs lend extra brightness. Hungry yet? The perfect dinner party side or Thanksgiving offering, Ilili Brussels Sprouts may take a bit of planning, but they are actually quite easy to make. Don't be scared off by the volume of steps below - I have included perhaps too ample directions so you too can get them just right! 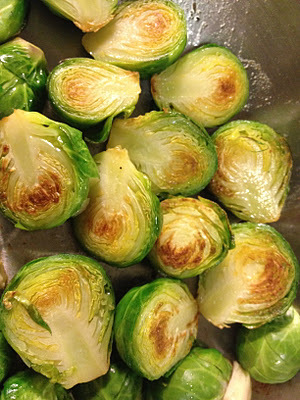 I chose to roast these Sprouts, though the restaurant typically deep fries them. If you are curious about the original recipe, you can find it HERE. 4 Tablespoon Toasted Walnuts, slightly crumbled. 6 - 8 Tablespoons Seedless Red Grapes sliced into halves or thirds. Can be prepared a day ahead and refrigerated. Bring to room temperature or warm slightly before using. Method - Combine Jam and Water in a small saucepan and bring to a boil. Allow to cook, gently boiling, for another 2-3 minutes or so, stirring occasionally until mixture thickens and is reduced by half. 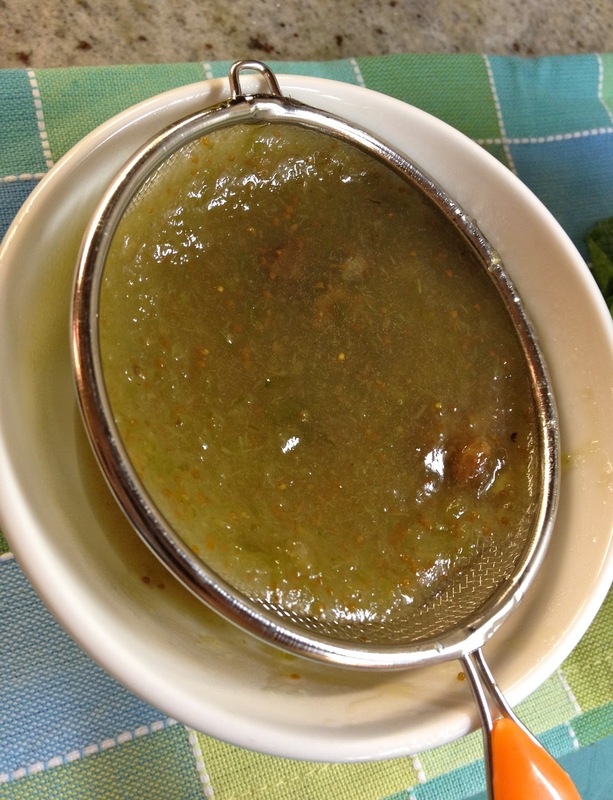 Remove from the heat and strain out and discard any solids. Alternatively, you can puree the mixture in a mini blender. Set aside. Yields enough for 1 batch serving 2-3 plus extra.Can be prepared several hours ahead and refrigerated. 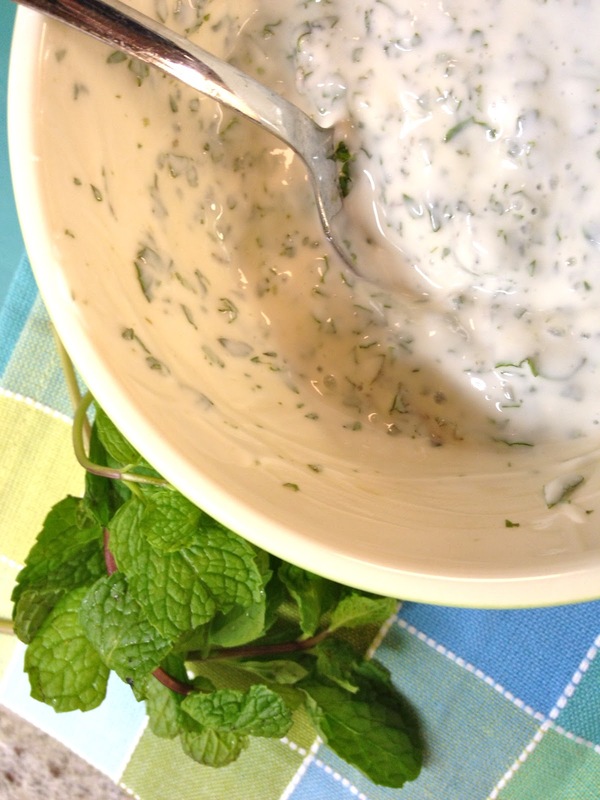 Method - Combine Yogurt, Mint, and Water. Stir to incorporate. Next, start by stirring in a 1/4 teaspoon of Salt first and taste. * If you choose to add another 1/4 teaspoon Salt, you may find the Yogurt very salty. In the end, when all flavors are combined, the extra saltiness becomes very balanced, but I have a salty palate so use your discretion! You can always add more Salt later if you prefer. Place your oven rack in the upper middle position and preheat oven to 500. Clean and fully dry Sprouts. Remove some of the loose, outer leaves, especially the smaller yellow ones, and trim the woody Sprout base just enough to shorten it without cutting it so high that you sever the part that holds all the sprout leaves together. Pour Sprouts into a gallon ZipLoc bag and add a Tablespoon of Olive oil. Seal the bag and give it a good few shakes and squish it around with your hands so that Oil is distributed evenly. Next, spread Sprouts out evenly on a baking sheet and place in the oven. 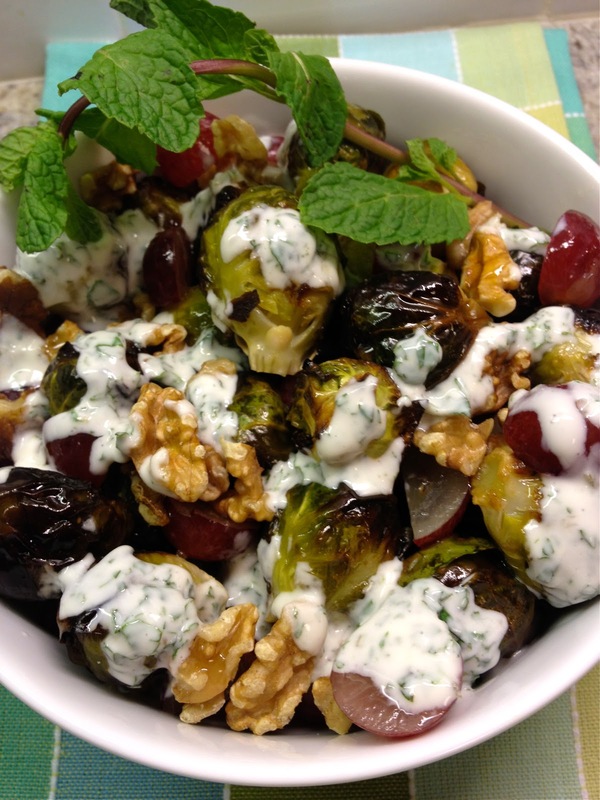 *If you haven't already prepared your Mint Yogurt or Fig Puree, now is the time, while your Sprouts are cooking. Both sauces come together fast! Cook Sprouts for about 18 minutes, shaking the pan twice or more throughout the cooking process to turn the Sprouts and cook them evenly. If you like your Sprouts more well done and less al dente, cook for up to 20 minutes - you can feel free to remove a few extra-browned leaves that may result once you are done and Sprouts have cooled slightly. Instructions for that follow. When cooking is done, the Brussels Sprouts will emerge partially browned and crispy on the outside but the first interior leaves should be green and the Sprout itself should be tender but not mushy. Even if they look very browned to you, don't worry - it will all taste great in the end. If there are some overly browned parts that seem too burnt/bitter, feel free to let Sprouts cool a bit and peel just a few of the darker leaves off and discard. When in doubt, taste! Let Sprouts cool slightly and place in another ZipLoc bag or bowl. Pour in half a teaspoon of Sherry Vinegar, seal, and give the bag a good shake. Sprinkle ever so slightly with Salt if you choose. Plate your Sprouts in one serving bowl, alternating layers of Sprouts, Grapes, and Walnuts. Next, the two sauces should be drizzled over everything in a crosshatch pattern. You should use about 4 Tablespoons of the Fig Puree and 4-5 Tablespoons of the Mint Yogurt. Do not over-sauce, you can always serve the extra Fig Puree and Yogurt on the side. Optionally garnish with Mint Sprigs or a sprinkling of Chopped Mint if you choose. In the words of Ilili Restaurant/ The Recipe Author - "You’ll know you’ve perfected the seasoning when you get the perfect bite - a balance between bitter, salty, sweet, and sour and the umami." Fall Time! The season of leaf-peeping and fuzzy sweaters. The time of year when a girl's thoughts turn towards pumpkin spice lattes, hot apple cider, and pumpkin beer (we ladies sure do love us some pumpkin beer). From Oktoberfest to football, there's something for everyone. 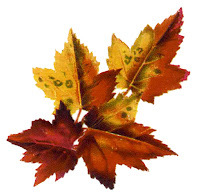 Another thing I love about Fall? Amazing produce. Whether Pumpkins, Brussels Sprouts, Squash or Apples, Autumn's bounty can equal major cooking inspiration. In this week's spotlight we have Figs, Apples, and Butternut Squash - all fantastic right now, and very versatile. 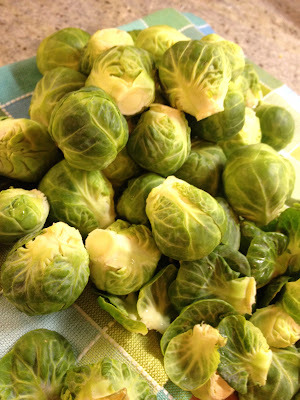 Tune in next week for an exciting twist on my long time love, Brussels Sprouts. Here, we road tested a (new to us) Squash and Apple Soup Recipe, and prepare beautifully ripe Figs in an unexpected way. Enjoy! First - The soup. I'm a big fan of Squash and Apple Soup. I love it as an easy, make-ahead addition to a fall feast, (check out a Foolproof Fall Dinner Party Menu here) or as a hearty side dish for an everyday weeknight meal. We tested out Martha Stewart's recipe (she is my main squeeze, after all), whereas I usually rely on Ina Garten's delicious version of this classic. The verdict - Martha's was great as well. Different. A bit spicier and lighter. Ina's version is a touch sweeter, a wee bit richer, and seemed more apple focused. You can't really go wrong with either. This soup freezes easily and keeps for up to a month. In the fridge, it will keep for 3 days. 1 Butternut Squash (about 2 Lbs) peeled, cored, and chopped. Melt Butter in a large saucepan over medium heat. Add Onion and cook, stirring occasionally until it begins to soften, 4 minutes or so. Next, add Squash and cook, stirring occasionally until soft, about 10 minutes. Add Apples, Salt, Cumin, Coriander, Ginger, Cayenne, Black Pepper, Chicken or Veggie Stock, and the water, until the solid ingredients are fully covered (add a bit more if you need). Reduce heat to a simmer and cook until vegetables are very soft, 30 to 35 minutes. Puree the mixture in batches in a food processor, or better yet, blend it using an immersion blender right in your pot until you reach your desired consistency. You may thin it further with a bit more water if you like. To serve, portion soup into shallow bowls, lay the Green Apple Crescents in the middle of the bowl, dot the middle with Fromage Blanc, and sprinkle Jalapeno Slices around the middle. Next Up - A really delicious and easy fig pasta that I adapted considerably from a recipe I found in Southern Living. Their version of the pasta included more of cream sauce, which we aren't big fans of around here. My version has just a touch of creaminess. In this dish, the taste of the sweet Figs (use only the ripest), salty, smokey Pancetta and bright Basil really do stand on their own. Use lots of black pepper to wake up all the flavors in this delightful, fast, and attractive plate. Cook Pasta in Salted boiling water according to package instructions, making sure to reserve a cup of cooking water when you drain. Set pasta aside. Next, saute Pancetta, Garlic and Shallot in a large skillet over medium heat stirring very often until the Pancetta is golden and the Shallots have become tender. To the skillet, add the Grated Parmigiana Cheese, Half and Half or Cream, and 4 Tablespoons Pasta Water. Stir vigorously until the liquids are incorporated and the Cheese is melted. To the skillet, immediately add the Cooked Fettucine and toss everything gently. Turn the burner up a bit and add more reserved Pasta Water, Tablespoon by Tablespoon, until sauce thickens a little bit and your desired consistency is reached - you can use up to about a half cup if needed. Taste for seasoning and add a bit of Salt if necessary (the salty Pancetta will have most likely given it enough flavor) and lots of ground Black Pepper. To Serve - Plate the Pasta, top with torn Basil, and place equal amounts of quartered Figs on each bowl. Serve with extra Black Pepper and grated Parmigiana on the side.